TOKYO -- Takanobu Ito took the helm of a teetering Honda Motor Co. in June 2009 with a curious mixture of pride and angst. The global financial storm was bearing down hard. And his predecessor, Takeo Fukui, was ruthlessly slashing costs and gutting some of Honda's most promising programs, including the V-8 Acura and NSX sports car, to keep the company in the black. "Feeling honored was 47 percent of my reaction," President Ito recalled of being tapped for the top job. "Thinking 'this is going to be very tough' was about 53 percent." Indeed, for most of his tenure, Ito has struggled to right the ship. But now, after three years in office, the blunt-talking executive who joined Honda because he wanted to work on motorcycles and airplanes is ready to put his recovery plan into action. Sweeping revival plans that he has quietly been slipping into place are taking hold. The overhauls encompass everything from product planning and design to technology. Ito hopes they will not only recoup lost momentum but deliver record growth. Little did he know in 2009 how tough the turnaround would be. The yen's climb to record-high, profit-eating exchange rates and then last year's double-punch of natural disasters hammered Honda hard. And, worse, a company long praised for fleet-footed innovation was flat-footed on new product. Customers and critics snubbed nameplates such as the Honda Insight and CR-Z -- even the once-bulletproof Civic small car. Signs of big-company disease crept in; Honda was chasing numbers but had a tin ear for the market -- something even company leaders admit. Honda had lost its mojo, and Ito knew it. "I understand when people say that Honda had not been doing very much for two-and-a-half, three years," Ito, 58, said in a recent interview. "When people looked at it from the outside, they found it difficult to understand what was happening." Yet behind the public facade of inaction, Ito was busy building a comeback strategy. -- An overhaul of the company's entire drivetrain technology. -- Global restructuring of product development. -- New blood in design. -- Streamlined management aimed at faster decision making. This fall's high-stakes launch of the redesigned Honda Accord sedan -- marking the U.S. debut of the new powertrain -- will test Ito's efforts. More changes will follow, including a next-generation Honda Fit small car arriving next year. The Fit will be produced through the company's radically new regionalized product development process. Also in the works is a new design language aimed at spicing up traditionally staid styling. Ito took the helm at age 55, relatively young for a Japanese CEO. He was tapped by Fukui, then 64, as a hard-charging, think-outside-the-box upstart from a fresh generation. When asked to describe Ito during a press conference at the handover, Fukui said, "In a word, I would say 'tough.'" A hands-on type known to commute to work on his Honda CB1100 motorbike, Ito likes to be in charge. When becoming president, he famously took on another role as head of Honda's development subsidiary, Honda R&D Co. He has since given up that duty, but it was his second time in that post, speaking to his penchant for being in control. But Honda has a hard climb ahead. It will take several years for the changes to appear in the entire lineup and trickle through the whole company. Meanwhile, rivals have capitalized on Honda's slump to steal U.S. sales and market share, leaving Honda in catch-up mode. "Honda was getting this reputation that we were losing the brilliance we used to have. And that's something we were starting to feel ourselves," says Toshinobu Minami, the new global head of exterior design appointed by Ito in September. "The company has gotten so large, we were only pursuing efficiency. And probably during that time, we came to lose the uniqueness that the market came to expect from us," he says. "We probably started just thinking, 'Oh, this should do,' and stopped setting high targets or goals for ourselves." Indeed, Honda's obsession with size manifested itself in the company's monthly sales and production reports. 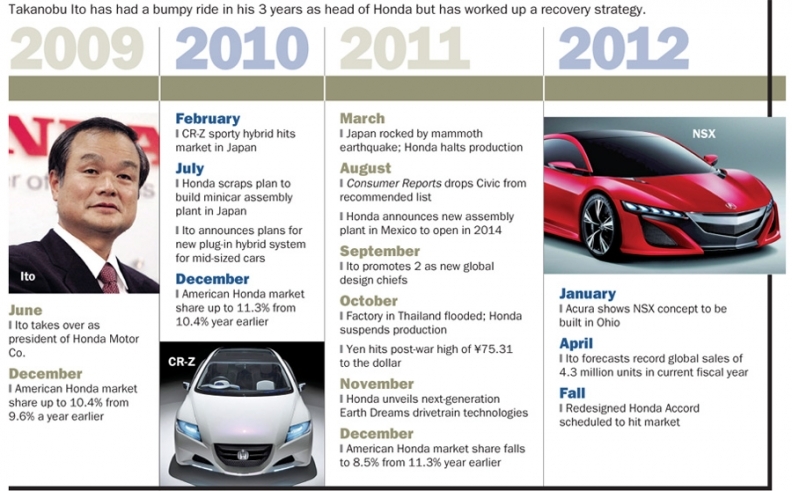 They invariably were headlined: "Honda sets all-time record for auto production." Chasing record output was a key internal benchmark. So was maintaining healthy profits despite repeated financial blows. Honda has never suffered a full-year loss, operating or net. But extreme cost-cutting was needed to stay in the black. That led Honda to kill the NSX, quit Formula One racing, cut jobs at home and abroad, drop plans for a minicar factory in Japan and go no-frills on interior design. New global interior design chief Yoshinori Asahi linked the financial crisis to compromises in the "sense of quality or perceived quality" on Honda vehicles. "That's what took shape in those criticisms from Consumers Reports," he says, referring to the influential U.S. magazine's decision last year to leave the Civic off its list of "recommended" vehicles for the first time in more than a decade. Yet despite tight purse strings, Ito re-invested in new technology -- especially drivetrain technologies -- to compensate for Honda's lackluster hybrid system and to match the cutting-edge fuel-injection engines offered by rivals. "We had to improve the fuel economy of our cars," Ito said. "I immediately began laying the preparations necessary to achieve this. We tried to innovate our engines and transmissions while also coming out with a fuller lineup of hybrid models." What ensued was a suite of six new engines, three transmissions and two hybrid systems known collectively as Earth Dreams. The common thread is the addition of fuel-injection technology and continuously variable transmissions. A 1.6-liter diesel engine is also part of the mix, though there are no plans to bring that to the United States. The goal: to achieve industry-topping fuel efficiency in every vehicle class in three years. Honda CFO Fumihiko Ike recalled that dropping Formula One racing was a key move in developing the Earth Dreams powertrains: "Previously we allocated between 600 to 800 people for Formula One racing. All those people are now involved with regular r&d." Ito unveiled the technologies before last year's Tokyo Motor Show. The first U.S. car with the new powertrain, a direct-injection engine mated to a newly developed continuously variable transmission, will be the redesigned Accord. Ito compares the impact of Earth Dreams to that of the famed CVCC engine project from the 1970s that cemented Honda's image as an engine company first and foremost. "In talking about the impact on our business, it is as important as CVCC," Ito said. "This is very, very big." Yet Earth Dreams is only one piece of the plan. Ito also blew up the company's traditional Japan-led product development strategy. The new approach empowers regional engineers to tailor cars to local tastes and local procurement. Global nameplates will be developed in parallel at r&d centers in six operational regions -- Japan, North America, China, Asia-Pacific, South America and Europe. The cars will share certain main components such as engines and bodies, but other parts will differ according to local specifications and regional procurement possibilities. The first car getting this treatment is the third-generation Fit due next year. To speed localization, Ito in February named Erik Berkman head of Honda R&D Americas, leading design and product development. 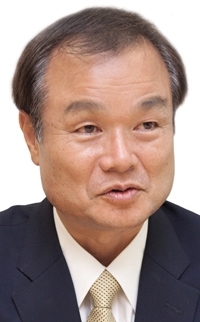 He is the first non-Japanese executive in the post. Ito also entrusted the United States with the production and some development responsibilities for the Acura NSX sports car. Ito, who worked on the original all-aluminum NSX that went on sale in 1990, resurrected the car to inject more excitement into the brand. He picked Ohio as the production site because North America is expected to be its biggest market. Ito turned next to design, a nagging sore spot. The Acura brand had yet to latch on to an inspiring look, and the interior of the latest Civic was panned as plasticky. Last September, Ito moved aside Nobuki Ebisawa, 58, after seven years as global design chief to inject younger blood. Enter Minami, 44, and new interior design chief Asahi, who quickly shook things up. Work that had previously been handled solely by Ebisawa was split in three. Minami handles exterior design; Asahi, now 48, gets the interior -- and both are freed from matters of budgets, personnel and materials. An administrator now does that. "The idea is to have an emphasis on speed so we can make quick decisions and reactions," Minami says. Another big change: No more design evaluation meetings. The new design chiefs banned them. Instead, Minami and Asahi patrol the studios and make executive decisions on the fly about which sketches should be kicked upstairs to Ito. "We just said, 'OK, evaluation meetings and report presentation meetings are prohibited,'" Asahi recalls. "You have to prepare so much presentation materials. It was a waste of time." The two are now working on more expressive design language for Honda and Acura that will debut in full for the 2016 model year. Hints of the more edgy look can be seen in the NSX concept shown at January's Detroit auto show and the sleek Honda AC-X hybrid sedan concept shown at last year's Tokyo show. Less red tape, more sales? Outside design, Ito has also tried to cut red tape. In April 2011, he eliminated a management layer between him and the division chiefs. Now Ito himself is in direct control of Honda's automobile division as its COO, with direct reports from only three unit heads, instead of five. Ito's overhaul is still a work in progress. The first Earth Dreams technologies reach the market this year only in some models, and the new design language will debut even later. Despite the benefits of the Earth Dreams drivetrains, the fuel injection and CVT systems are less a leapfrog ahead of the competition than a move to keep pace. It is also unclear how either will be received. In the past, Honda trumpeted the integrated motor-assist mild hybrid system used in the Insight, CR-Z and Civic hybrids as a game-changer, only to lose the first round of the hybrid battle to Toyota and its Prius. But Honda has key strengths, too. It was the first Japanese automaker producing cars in the United States -- at its Marysville, Ohio, factory in 1982. Honda has relatively low exposure to auto exports from Japan. Exports account for only 9 percent of Honda's global sales, far less than at Toyota, Nissan, Subaru, Mazda or Mitsubishi. Ito's revival plan was delayed by a year; Honda lost most of 2011 rebuilding from the devastating earthquake in Japan and the massive flooding in Thailand. Now, Ito vows that 2012 is the turning point. Indeed, despite the unflattering reviews of the latest Civic, the car has been selling well in the United States, racking up its best May sales since 2008. It was the No. 2 selling U.S. car in May and is the third-best seller for the first five months of 2012. What's more, Honda ranked No. 1 in perceived quality among volume brands in the spring quality survey by ALG, the TrueCar Inc. subsidiary that sets residual values for the auto industry. It has held that spot since 2010. Insiders say Ito also may unveil a midterm business plan, Honda's first since 2010. Confident that his fixes are taking hold, Ito is forecasting a return to sustainable growth with record global sales of 4.3 million units this fiscal year, which ends March 31, 2013. "At Honda we need to grow and want to grow," Ito said. "Honda has never recorded global automobile sales exceeding 4 million units. But in the next fiscal year, we definitely want to do that and expand from there."